These pretty little mushrooms, called Mycena haematopus, bleed deep red when the stem is cut, especially at the base. Although there are other bleeding Mycenas, this is the only one that fruits on wood, making it easy to identify. This piece of wood was barely able to hold it's shape and had no bark left on it. It was, in fact, so well-decayed that I can't say what kind of wood it was. There were Garry oak (Quercus garryana), Pacific madrone (Arubutus menziesii) and Douglas fir (Pseudotsuga menziesii) in the area. In the four years or so that I've been paying attention to fungi, I've usually seen these mushrooms singly or, perhaps, with one or two others, so I felt as though I was attending a delightful little soiree while sketching this comparatively large group! If you look closely, you can see several new buttons poking out of the wood on the left. After too much frost and not quite enough rain, it's warmed up here and there's a steady supply of water falling from the sky. Guess what that means? Mushrooms! Mushrooms in little armies marching under conifers and standing solitary under oaks. Mushrooms poking up out of the leaves in the forest and mushrooms sprouting from wet, decaying wood. I've been getting out as much as I can to find them. 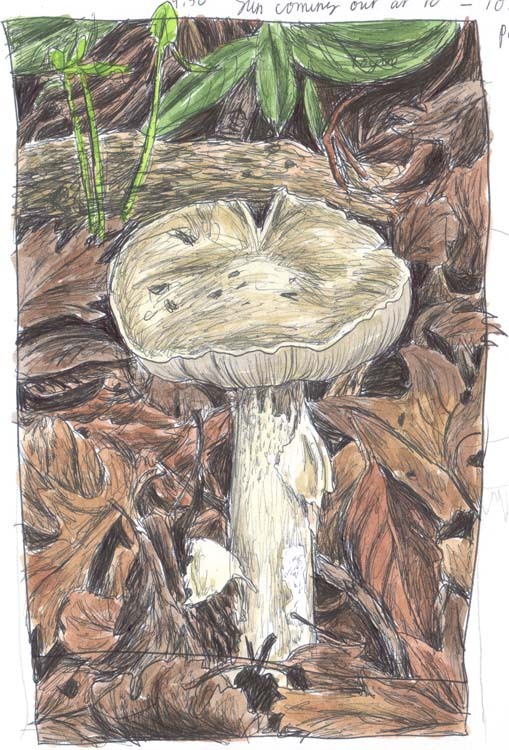 So far, it's a fabulous year for mushrooms and it's hard to choose which fungi to draw when I do get out. In the past week, the deathly invader, Amanita phalloides has suddenly risen, in little groups, big groups, and by itself, scattered about Howarth Park, and elsewhere. 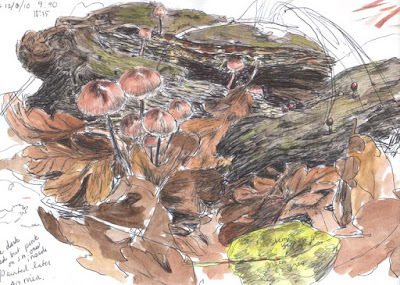 This one was a bright beacon, as I walked along a trail, begging to be sketched. I felt compelled to oblige. It's almost winter and Double-crested cormorants (Phalacrocorax auritus) have returned to Lake Ralphine. They can be seen swimming low in the water then suddenly diving out of sight, only to return, often with a fish caught in their beak, which they flip about and swallow. Once they're done fishing, they fly up into this California black oak (Quercus kelloggii) or a Western cottonwood (Populus fremontii) that's nearby and spread their wings to dry and just generally hang out. Although the oak looks dead it isn't, not yet, anyway. It may be that being chosen by these large birds could eventually be the death of the tree. During breeding season Cormorants nest in colonies and the large amounts of....uh...poop that falls from the nests and from the adult birds makes the soil too toxic for the tree that the birds are nesting in, eventually killing it, forcing the birds to choose a new nesting site. 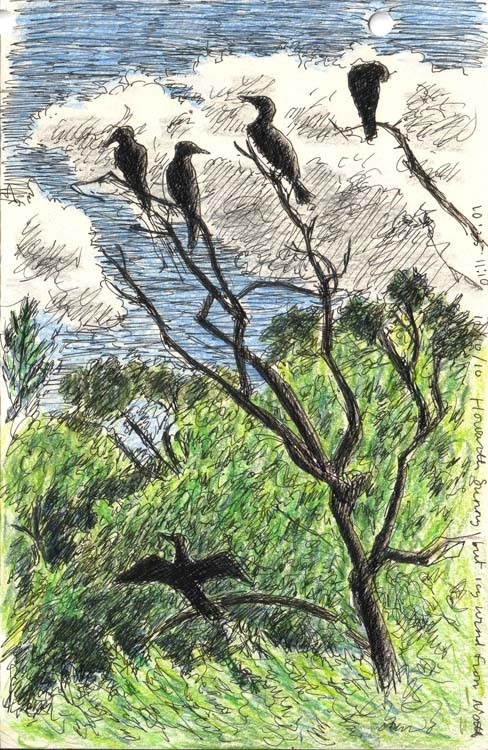 The Cormorants that spend the winter at Lake Ralphine aren't nesting but they certainly are loitering and congregating in one place, this California black oak.